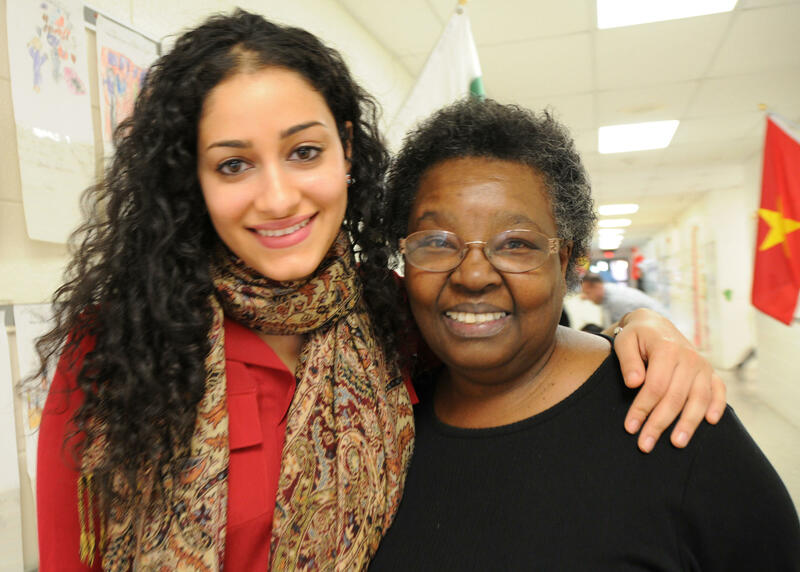 WUNC's Reema Khrais and her first-grade teacher, Lawanda Rainey-Hall. WUNC has a new initiative called My Teacher. As a part of the project, students around the state are interviewing their teachers. WUNC education reporter Reema Khrais recently surprised one of her favorite teachers, Lawanda Rainey-Hall. Reema was one of Ms. Rainey-Hall's first grade students at Glenwood Elementary in Chapel Hill. "Mrs. Rainey-Hall brought a warmness and love to the classroom that's hard to forget," Reema recalls. "I remember she encouraged us to read and write as much as we could, even as first-graders. I learned an incredible amount from her." Ms. Rainey-Hall had a long career in the Chapel Hill-Carrboro schools. She retired just last year. But it wasn't hard to find her. She was back at Glenwood, where she volunteers regularly. "I come in and listen to the readers. I love it." When she found out that Reema had become an education reporter, Rainey-Hall was very pleased. In fact, as the two were talking in the hallway, she told three different people that her former student had come to say hello, and that she was now an education reporter. The two will likely see each other again soon. Glenwood Elementary is planning a 60th anniversary celebration. >> Browse our Tumblr for writing by and for teachers.